We received this product for review purposes. As always, all opinions are honest and solely those of myself and JustaBXgirl. When I was a little girl I used to love playing video games with my dad. We would play even before I went to school some mornings. My mother would get so annoyed. She would be trying to get me out the door and my dad would be promising me one more level. Today, JustaBXgirl adores playing video games with her grandpa. They do not play before school though. Not on this mama’s watch. I normally lose attention in video games pretty quickly. I’ll play a few minutes then move onto something new. JustaBXgirl takes after me in this somewhat. A lot of times JustaBXgirl will relinquish her turn to her cousins after a few minutes of play. This is not the case however when she plays LEGO Ninjago. 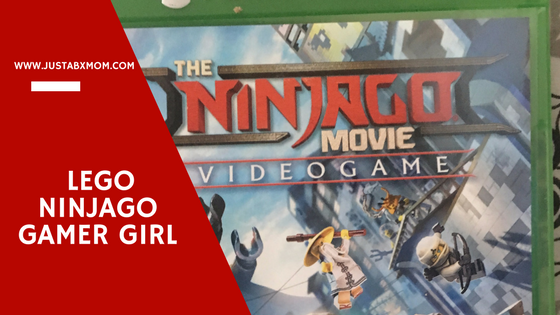 JustaBXgirl is a big fan of all LEGO games. She can figure them out and advance pretty much on her own. She was doing tricks on Lego Ninjago almost as soon as we turned it on for her. It is a lot of fun for this mama to watch her little figure out her next move. And then there are the arguments between her and her cousins. JustaBXgirl is always focused on advancement. She wants to get to the next location. Her cousins want to collect all of the studs. We haven’t seen the movie so I think it is amazing to see her figure things out in the game without having background information. The other day she had cleared a certain part but didn’t reach a checkpoint. When JustaBXgrandpa put the game back on for her he tried to give her directions on where to go and she tried to tell him she had already done it. He didn’t believe her until she cleared the area again swiftly. This game is fun for the whole family. And I love that while it does contain fighting and amazing graphics they are family friendly. It is, in my opinion, a game that you can feel okay leaving your child playing while you’re going about your time. I leave my daughter playing while cooking dinner or doing some work and get a few minutes uninterrupted until she needs something read. Love this my crew is all all about Xbox One and they do watch the show, Ninjago sometimes. We have not seen movie yet wither but def will be checking out the game thanks to you. OOOH LA LA! I think I want this too! Easter Basket Ideas: Gamer Edition! February Bookshelf – What We Love To Read! Affiliate Disclosure: Please note that when you click links and purchase items, in some cases I will receive a referral commission. I thank you for your ongoing support. 2019 Biggest Baby Shower Is Coming! Get Your Biggest Discount Tickets Here!